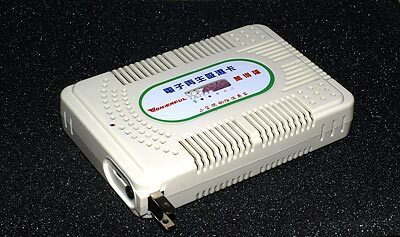 Thanks to Yin, Lau, Jeff, Wai Fon, Andersen and Jason for some of the items in this blog entry. Okay, there might not be hope for this one. Pentax P30t 35mm film SLR with Auto Chinon 135mm F2.8 manual focus lens; Olympus OM-2000 35mm film SLR with Olympus OM Zuiko 50mm F1.8 lens; Sony Alpha A100 APS-C digital SLR with Minolta 50mm F1.4 lens; infrared-modded Fujifilm Digital Q1 digital camera with DIY-52mm-to-Minolta-MD-adapter and Seagull 50mm F1.8 lens. These are the brightest lenses I have for each camera. Pentax P30t with Vivitar 75-205mm F3.5-4.5 manual focus lens with matched-multiplied 2x teleconverter (making it a 150-410mm F7.0-9.0 lens); Olympus OM-2000 with Soligor 70-220mm constant aperture F3.5 manual focus lens with Vivitar 2x teleconverter (making it a sweeet 140-440mm F7.0 lens); Sony Alpha A100 with Minolta 70-210mm constant aperture F4 “beercan” lens; Fujifilm Digital Q1 with DIY-52mm-to-Olympus-OM-adapter and Olympus Zuiko 70-210mm F4.5-5.6 manual focus lens. Believe it or not, the one with the furthest apparent reach here is the Fujifilm Digital Q1. With its 6x crop factor it gets 1260mm equivalent focal length! 2640mm can be gotten if I mount the Soligor 70-220mm F3.5 with 2x teleconverter on it instead. Sony Alpha A100 with Sony HVL-F56AM (guide number 56m at ISO100); Pentax P30t with Canon Speedlite 580EX (guide number 58m at ISO100); Olympus OM-2000 with Nikon Speedlight SB-28 (guide number 36m at ISO100). This does not mean I have become full-time flasher. I’m not completely against the idea of using flash; I just think it’s stupid to be unable to take pictures without flash. 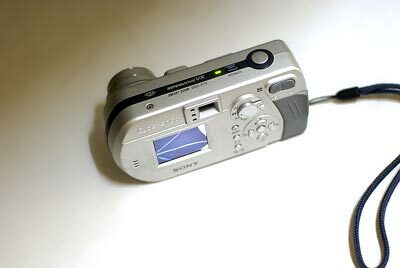 I liked playing with wireless flash (and Minolta/Sony’s implementation works perfectly) but I will not die without it. 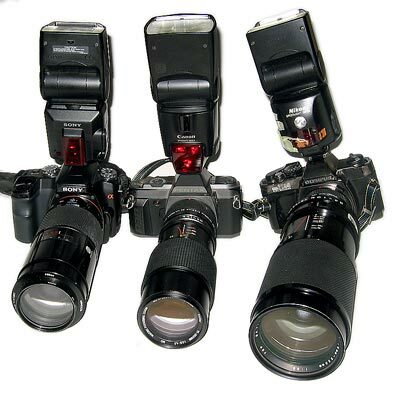 A blog entry about the HVL-F56AM’s wireless flash capabilities will come soon. Yes, Minolta (now swallowed into Sony) came up with wireless flash before Nikon started getting all these annoying CLS fanboys whose brains are incapable of using any other camera. I find myself perfectly able to use any common camera brand system. Hello it’s not that hard! The EV icon looks like a -/+ icon all the time. The flash icon is always a lightning icon. Is it that hard to pick up a camera and turn it around in your hands to look for buttons? Same goes for point-and-shoots. Some brands may require menus to access certain functions, but it certainly is not impossible to find, if people say the feature is there. And what if you can’t find the ISO setting on old Nikon Coolpix point-and-shoots? Set the EV to underexpose, then bring the exposure back to zero in Photoshop and you have a higher-ISO image! Go figure out a bellows medium-format camera. I’ll shake your hand. Ah yes, I’m whining about whiners. …I also think by the time you have gotten past these pictures and brand alphabet soups that I’m all for all mount compatibility and defying the limitations set by proprietary brands. Peace and unity! 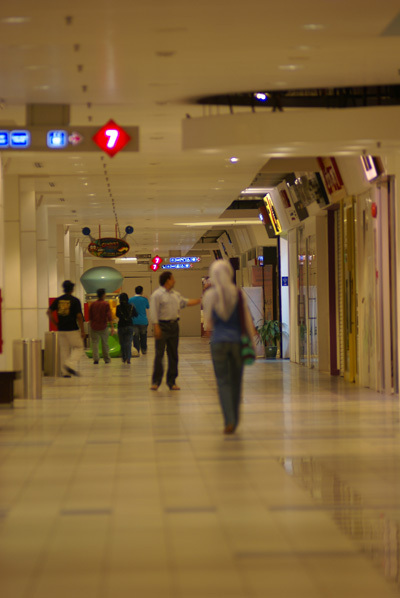 This is the widest I’ve ever got with my Fujifilm Digital Q1 using a 35mm-format SLR lens. The Vivitar 24mm F2.0 paired with a Pro Tama 0.45x wideangle converter (which feels more like a 0.7x) gives a… 24mm * 6x crop factor * 0.7x wideangle = 100.8mm F2.0 equivalent. Add the fact that it is sensitive to infrared, and you get much higher shutter speeds! I eventually returned to the Pentax K-mount. (The first SLR lens I bought was a Cosina 19-35mm F3.5-4.5 AF K-mount.) 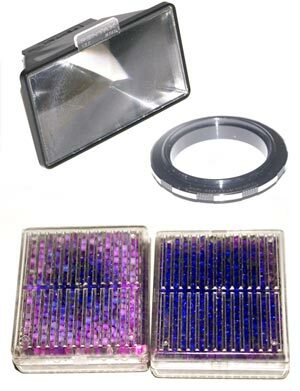 I’ve already identified these lenses earlier so spare me the alphabet soup! 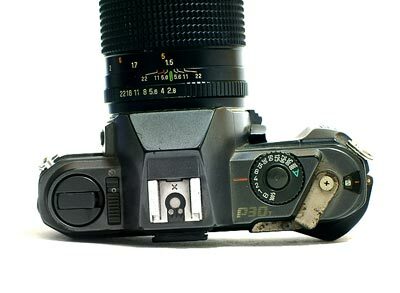 Pentax P30t, with PASM modes. Set Aperture and Shutter to Auto for Programmed Auto-exposure. Gotta love the separate flash-sync speed on the shutter speed dial! Pentax flash diffuser, Pentax-K-mount-to-49mm-filter-thread reversal ring (oddly, a sticker on it says Pentax-M49 which is not true because the M49 mount has a different screw pitch (aka the thickness of screw threads) than a 49mm screw filter thread) and silica gel in a microwaveable plastic container. Microwave them for 7 minutes at low heat to turn the gels blue. When it turns pink it loses its effectiveness. Yeah, with all these I got a non-electric dry box. I also got this; it plugs into a wall socket (with adapter) and heats up the silica gels inside it. This is great if you have an air-proof box which you can then use as a dry box. The silica gels absorb moisture and keep the insides dry, to protect your lenses from getting fungus. 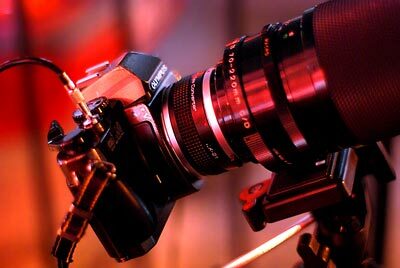 The good ol’ shutter release cable! Top-left: Unscrew the ring, and when you press down it will lock. Press the ring to unlock and release the shutter. Top-right: Screwed in, it does not lock. Bottom: This is where the shutter release cable screws into; sadly, digital SLRs don’t have this anymore. 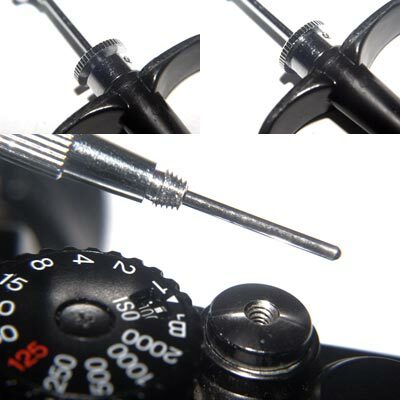 Pressing on the shutter cable makes the pin extend by hydraulic pressure, activating the shutter. 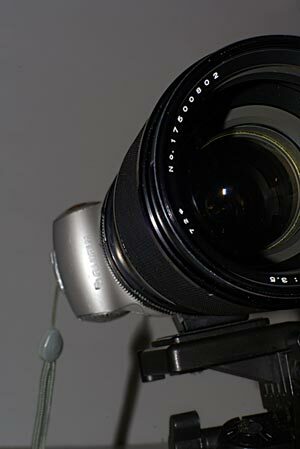 A shutter release cable is useful for bulb mode, when you want to do long exposures. You’ll tire your fingers holding the shutter down for over a minute! 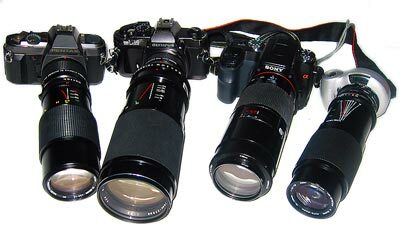 In this case, the Olympus OM-2000 has the Soligor 70-220mm F3.5 lens with Vivitar 2x teleconverter. 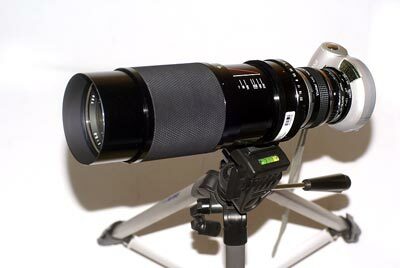 I might add that the monstrous Soligor has a tripod mount (my only lens with tripod mount) and a macro extending ring (though macro is questionable because it doesn’t go to life-size magnification). 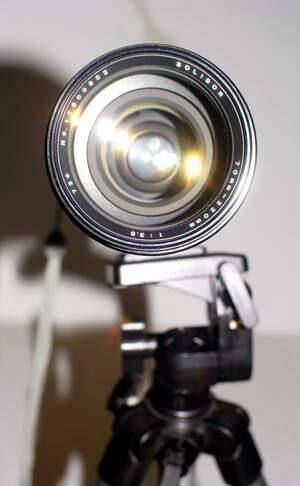 …the lens eclipses the camera! Looks like a mini telescope. How cute. 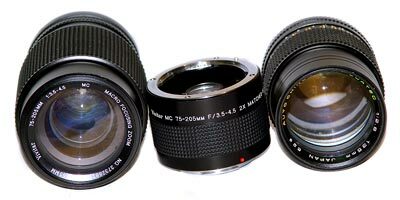 The front takes 72mm filters. It’s a bit screwed up though; at 70mm it cannot focus on infinity. 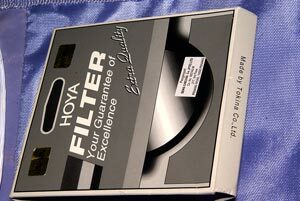 Hoya filters are really made by Tokina! Who the heck are you guys now? And now, for stuff that is not in my custody. 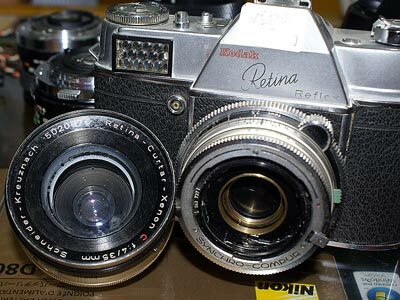 Kodak Retina Reflex with 35mm F4.0 lens. 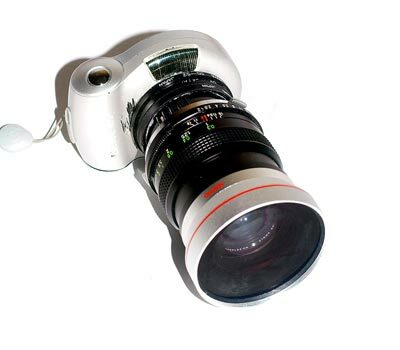 This is great fun to figure out, It has two sets of lenses and rings! Please download this file and check its EXIF data. From the picture, you’d be able to tell where you can get this gem of a lens, at a great bargain, too. I’d have gotten it if I had the money (and use such focal lengths often). This entry was posted in Geek, Pictures, Rants on March 12, 2007 by 2konbla.